Discussion in 'Guides & Hero Builds' started by eXdig0, Jan 6, 2018. Every 30 secs Harpy gains stacks, that nullify all incoming attacks to 1 dmg. Any received damage – reduces number of stacks by 1. Dots (Lorraine’s poison, Cleo’s ember) do reduce stacks too, every time they tick. Different difficulties have different stack numbers. Easy-Normal-Hard-Hell are 150-200-300-400 accordingly. So you need characters, who do a lot of attacks in a short time. Let’s call them stack-killers. Those are: Aisha (crit capped), Morrah (with some additional melee characters to increase the efficiency of her Hellfire), Mediana (with UW), Mitra (with UW), Dimael, Roi, Reina, Lewisia, Nyx (+|-), Theo. Those are the most “fast” characters when it comes to stack reducing. Do not ignore this mechanic because if you do not take stacks off fast enough – you will have too low time to dps the boss. Stacks are resetting not on 4:30, 4:00 etc, it’s more like 4:25, 3:55. Boss does single target damage with all auto-attacks. No splash or smth. Damage is magic, so main tank should definitely have M.def bracelet equipped (do not use Rings, I’ll explain later). With a strong blow she knocks the main tank down, demoving all buffs. It is not written in Boss info, but after her “All shall perish” skill on 75-50-25% boss hp – she gets increasement in auto-attack damage. At Hell difficulty after 25% she was doing around 1,5kk per hit for a tank with 140k++ total m.def. So your maintank should be really tanky. The mechanic is quite simple. Beam does FIXED damage based on target’s maximum HP. And this damage is magic. But still FIXED. That means stacking m.def won’t help you. You can’t block this damage via M.Block chance, you can’t reduce it with M.Tough runes in weapons. All of those things DO NOT help. So don’t place m.def bracelets for your healers or dd’s in case of defending against Beam. But while this damage is still magic – you can block it with Arch’s immune skill, and it procs Fluss’ passive, for example. I tested that info about runes/mdef/mblock more times than you can imagine before telling it here. The knowledge of this mechanic gives you: If you have problems with healing the party (because Healers are not first ones to equip with beast&best gear usually) – try replacing Orbs of all characters with +0 ones. Or lower starred, like 0* or 1*. The less hp unit have – the less damage it takes from beam, while heal is the same amount. Your main rival on this boss is HP rings and T2 HP passive for tank. They do not raise your survability for sure (except main tank only), but there will be harder for your healers to outheal the beam’s damage, or Spheres’ damage. Even p.def bracelet for offtank will be better than HP ring, seriously. a) You can simply outheal it. Yes, it is possible. Beam’s damage is divided into 3 stages: first 5 sec of “medium” damage (10% of hp per 0,5 sec) (10 times), knockback all the targeted enemies, another 6 sec of heavy damage (10% of hp per 0,3 sec) (21 times), that usually wipes the party. Yeah, it’s 5+6 = 11 totally. Even 2 healers can outheal it, those are Mediana and Kaulah. Medi uses spray at first 4 secs, then Kaulah uses his heal, being immune to cc while casting, and after he finishes – in 2 secs Mediana uses her 1st skill. After those manipulations beam can damage raid some more times, but definitely won’t kill anybody. You can add Frey’s shield before Kaulah’s heal, so he will start it later, after the shield is gone, so you won’t need Medi’s 1st. Your main goal is to use a little healing AOE skill at start, and use your best heals at last 6 secs of beam, keeping in mind that there is knockback. Do not use Frey’s shield at first 5 secs if you’re healing the beam, for example. Shield will just blow in 3-4 secs, then your team will be knocked back and start receiving fatal damage, while you can cast shield just before knockback to block it + some damage of Heavy Beam. This is the most confident way, you just outheal the beam every time. b) You can shield it. Arch and Badouin both do it. They have different CD and different buff time. 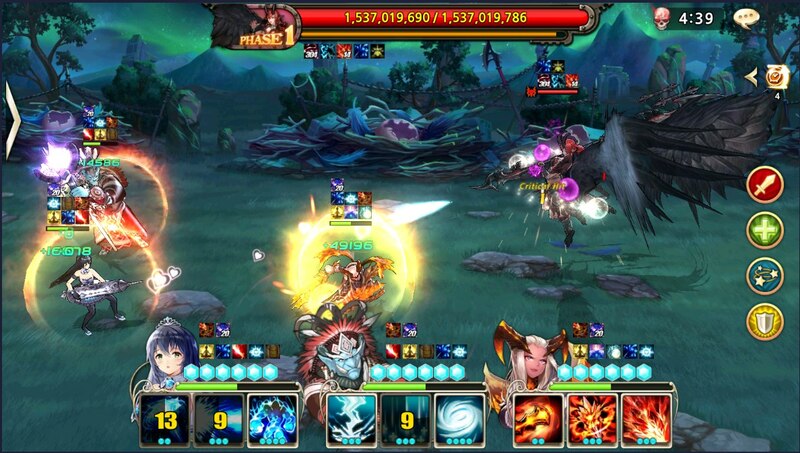 For example, Arch’s immune skill should be used just before knockback, to nullify the Heavy Beam damage, while starting damage is healed by any one AOE-heal skill. c) Take the boss down. Yeap, it is possible. Easy-Normal-Hard-Hell has around 30-37-55-80 cc bar. You can’t use Gau on boss, so Lorraine T5 is the best choice out of all other cc units. So the idea is just to take down boss when she starts casting beam. Beam will be interrupted and won’t be repeated immediately when boss wakes up. Easy/Normal – it’s the easiest way to bear with a beam. CC bars are kinda low, just be sure not to take down the boss before she starts casting (sits on her weapon) because in this case beam will be casted when it comes up to her rotation. Hard can still be completed via good CC characters, but it’s much more harder to do with randoms. While Hell is really hard to complete (still possible) via CCing the beam. Main problem of whole CC-idea is that boss is regenerating cc-bar while doing long animation casts on 75-50-25% hp. So you will usually face this situation: Boss is kept at 5% cc bar so you can take her down anytime, she will start casting beam soon. But you reduce her hp to 75% and she starts animations, while CC bar is filled up to 40-50 secs. Then all of your chars get 8 sec stun and after it falls – Darkness debuff takes chars’ mana, so you see the beam, you have 40-50 cc needed to take down boss, but you have no mana. And 40-50 cc is not like a “oneshot”. We were trying to do Hell via CC bar, but it was too random, so we dropped it after a bunch of tries. Hell boss has all the mechanics being raised, so you need more stack-killers, more dps, more defence etc. So just focusing on cc bar takes too much of your slots for other purposes, beam is not the only one mechanic here. 4. Mass stun (All shall perish). One more boss mechanic. Once she reaches 75-50-25% hp – she starts a long animation. She is immune to cc and damage while spinning her weapon in front of you, and she is regenerating cc bar. After she finishes – she deals massive damage to all units on the battlefield. Damage is magic. Damage is FIXED. And damage is dealing fixed damage of your CURRENT hp. Not maximum, but current, this is important. So this hit CAN NOT kill you. Noone will die directly from this hit. DD’s can die from Orbs or Orb’s debuff after this hit reaches them, but not from an impact damage. This blow is dealing around 60-80% of your current hp as fixed magic damage. The main danger of this skill is 8 sec stun after the hit. All hit targets receive “Darkness” debuff, that will proc in 10 secs, greatly reducing your mana and doing high damage. This debuff can be deleted via number of auto-attacks. So if you dodge the stun – you will just do some autos and debuff will be cleared. While this debuff takes your mana – you will have problems with healing/shielding your raid if boss immediately starts beam cast. (Except Bau, 0 mana skill FTW). Usually you need Frey’s shield to cancel the stun. Or Annett’s buff under overcharge. -. Ideal is having Frey Kaulah and Medi as supports. Laias is not effective here, while Beam’s damage regenerates your mana to heaven and Laias’s passive gives 0 survability against Beam’s damage. While her shield on main tank is dispelled by Boss’s autoattack combo with knockdown. -. As for main dds I’ve seen Mitra, Epis, Roi, Gladi. Those are units that can solo dps the boss on Hell, you just need around 3,5kk++ dps for any of them. And all other members can be picked aiming to deal with boss mechanics. Aisha can also be included as main dd, but she’s one of the main stack killers, so she usually doesn’t have needed skills at right time to DPS the boss. -. Any tank with high magic defence can be used. Morrah is one of the best because she can tank, buff magic block for herself against boss’s autos and still do a great job on killing stacks with her UW, passive and Hellfire skill. -. Do not forget that boss has high dodge chance passively, and it works on cc too. So if you pick your team with like 80 total needed cc – you will usually fail on Hell because for example one of Kaulah’s lightnings will miss. -. Do not forget about 40% atk Artifacts from WB shop. They do work here, and they work perfectly on healers, increasing their healing output. My Medi and Kaula both usually keep more than 5,5kk hps. -. For DD you can use Harpy mask. -. Still you can use any other chars as setup-core units. For example Rephy is good for removing stun from the team. I just said what heroes i've seen there, completing Hell myself around 9 times so far to look different units. Adrien, XiongZi and TheGreatWall like this.